For those of you who do not know, MA is working to offer a new specialty license plate, which according to their website will “support new farmers, farmers’ markets, and a vibrant Massachusetts food economy”. 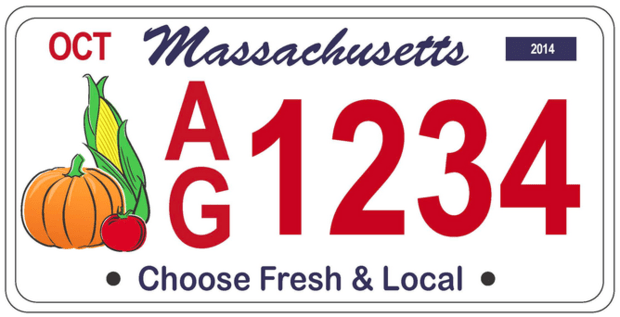 The cost of this specialty plate will be $20 per year ($40 per 2 yr renewal in addition to regular RMV license fees) and the tax-deductible proceeds will go towards organizations that both help new farmers to become established and to connect all farmers with MA consumers, like New Entry, Mass Farmers Markets, and Beginning Farmer Network of MA. This plate is a great way to support local and sustainable agriculture and to bring attention to the importance of local food sourcing and availability for all communities in MA. Before the plates can be printed and distributed, an initial 1,500 plates need to be purchased. So far, about 750 have been sold – the more quickly plates are purchased, the more quickly we will see these plates on the road. A sample plate is shown below. For more information, or to sign-up for your plate, visit www.mafoodplate.org. This entry was posted in Member Stories and tagged farm direct coop, license plate, Massachusetts agricultural license plate, support MA farmers by Jennifer Moore. Bookmark the permalink.